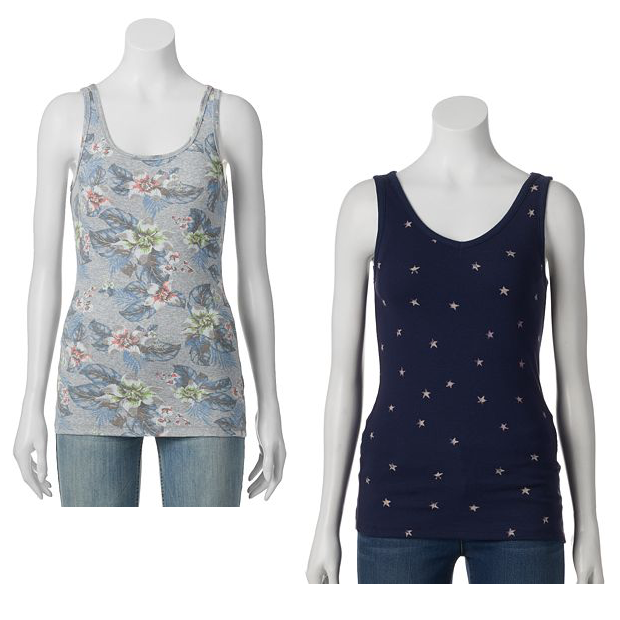 Tank Tops As Low As $3.56 At Kohl's! You are here: Home / Great Deals / Tank Tops As Low As $3.56 At Kohl’s! Tank Tops As Low As $3.56 At Kohl’s! These 2 Tank Tops are on Sale for just $4.99, which is already a great deal! But because you can stack deals at Kohl’s you can get them for even less! Buy 7 of these tanks for a total of $34.93 and get $10 Off instantly with online promo code SUMMERTIME, or use your in store pass! That makes the tops just $24.93 for 7 or only $3.56 each! The SONOMA life + style® Everyday Ribbed Tank and the SONOMA life + style® Ribbed Graphic Tank are available in a ton of patterns and solids, in multiple colors, from XSM to 2XL! What will you do with 7 tank tops? Everything! Or share with your daughters/sisters/friends!